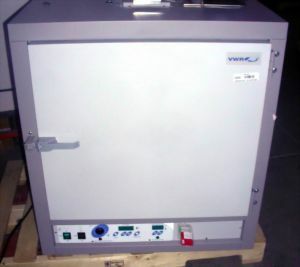 Product Description The VWR 1365 depyrogenation oven is ideal for small applications and is PID/microprocessor controlled. The 5 cu-ft oven features mechanical convection horizontal air flow. A DT HT filter on the air intake side facilitates removal of airborne gram negative bacteria. A plugged door provides maximum insulation and heat retention. Easy-to-read LED timer times up to 99 hours, 59 minutes, counts down "backward" and disengages the element at the end of the set time. Air flow is rated at 144LFM, which ensures quick, even drying of glassware. To ensure complete depyrogenation, the oven should be used in conjunction with a sterilizer (not included) and proper depyrogenation procedures for rendering glassware pyrogen-free. The 1365DP oven has a temperature range of 40 to 260C (104 to 500F) and has 1 adjustable shelf.